Edwin Swift Balch (March 27, 1856 - 1927) was born in Philadelphia, Pennsylvania to Thomas and Emily (Swift) Balch. His early childhood was spent in Europe and he received much of his education in France and Germany. In 1875 Edwin entered Princeton College as a sophomore. In April of 1876 he ended up leaving Princeton due to a misunderstanding with the President of the college. In a very public incident President James McCosh apparently felt very embarrassed and blamed Edwin for his embarrassment. Apparently Edwin and his father Thomas thought it was preferable to move on rather then continue to deal with hostility of the president. In the fall of 1876 Edwin began studying at Harvard University and received an A.B. Degree in June of 1878. Shortly after graduation Edwin began practicing law, in Philadelphia, with the law offices of William Henry Rawle. In 1881 he was admitted to the Philadelphia Bar. Edwin took a great interest in painting and art. In 1886 he exhibited some of his own paintings at the Philadelphia Society of Artists in the Pennsylvania Academy of Fine Arts. From 1887 to 1891 he would continue to exhibit his own work, yearly, at the Pennsylvania Academy of Fine Arts. Edwin also exhibited artwork at the Philadelphia Art Club in 1887 and 1890. In 1880 Edwin, along with Charles Chauncey Binney, H.W. Seton-Karr and a guide Christian Tuffli, made the first ascent of the "Piz Bevers" in the Egadine a part of the Alpine Mountains. Later, in July 1881, with two reindeer hunters, he ascended the highest point in the Trolltinder Mountains of Norway. 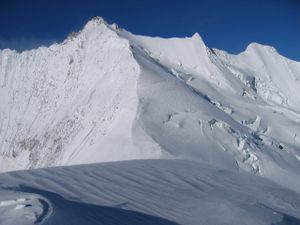 In 1882 he went to Switzerland, and with the help of guides Franz Burgener and Alois Antharmatten, ascended the Nadelhorn, one of the tallest points in the Pennine Alps. Following these initial climbs he made many climbs of numerous different mountains. During this time, and after, he wrote numerous papers on the subject of mountains. In addition to an interest in mountains he also seems to have had quite the interest in glaciers. During his life Edwin visited at least forty different glaciers in America and Europe. His observations helped to prove the origins of glaciers were purely from the cold of winter. One of his books, on the subject of glaciers, was Glaciers or Freezing Caverns. In 1902 Edwin traveled to, and explored, Antarctica one of the earliest explorations. While in Antarctica he named the eastern and western portions of the continent. In 1909 he recommended that the Nordenskjold Coast be given that name for the Swedish geographer and leader of the Swedish Antarctic Expedition Otto Nordenskjöld. It was this same man who in 1904 endorsed the idea of naming the two parts of Antarctica East and West Antarctica as Edwin had suggested. 1875 - elected a member of the American Whig Association while in Princeton. 1876 - member of the Appalachian Mountain Club. 1893 - member of the Philadelphia Club and the Society of Colonial Wars in the Commonwealth of Pennsylvania. 1895 - member of the Royal Geographical Society. 1895-6 - President of the Geographical Club of Philadelphia. 1897 - elected member of the Franklin Institute. 1899 - elected member of the American Philosophical Society. 1900 - member of the Sociedad Antonio Alzate of Mexico City. 1901 - manager and member of the publication committee of the Franklin Institute. 1902 - member of the Council of the Society of Colonial Wars in Pennsylvania. 1902 - member of the Wyoming Historical and Geological Society of Wilkes-Barre, Pennsylvania. 1903 - fellow in the American Association for the Advancement of Science. On October 5, 1904 Edwin married Eugenia Hargous Macfarlane the daughter of of geologist James Macfarlane. Later, in 1924, he married Emily Topscott Clark. Little is known about his final years but he did live until 1927.